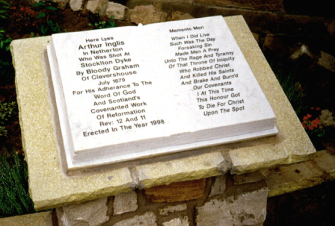 The modern memorial to Arthur Inglis was erected outside what was Wishaw Reformed Presbyterian Church (now closed). 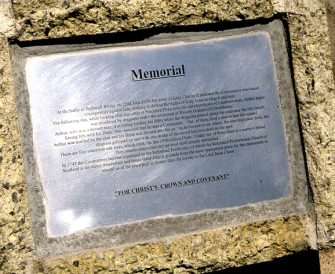 The stone memorial contains a plaque that gives a bit of Inglis' history. The marble Bible alongside copies the inscription that was on the original gravestone located in Cambusnethan Kirkyard. 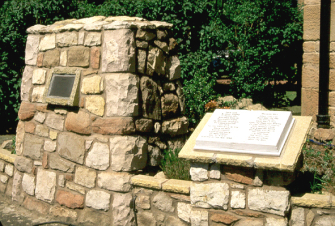 The new memorial was unveiled on 25 July 1998. Arthur Inglis, an old farmer, was sitting by the side of a stone dike at Stockelton Dike when he was approached by soldiers. As he had a Bible on his posession, which he was reading at the time, he was shot. The incident took place on 23 June 1679.